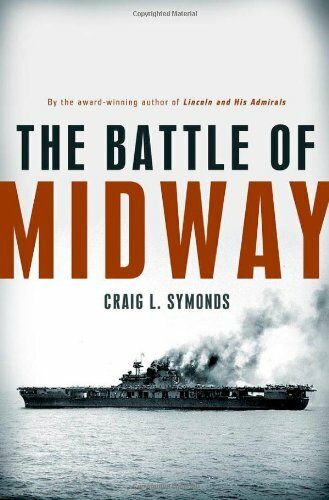 The last few days I have been reading the Battle of Midway by Craig L. Symonds. A very readable general history of the early days of the war and of course the battle itself. The book starts right after Pearl Harbor when Nimitz is assigned to CINCPACFLT, covers the battle of the Coral Sea, the Doolittle raid, and then fairly exhaustively covers the planning and execution of the actual battle. Prior to reading this book, I did not know much about Midway, other than that crypto intercepted some of the plans from the Japanese, and that the torpedo bombers were wiped out, which allowed the dive bombers to do their thing. I saw some reference somewhere to how D-day was celebrated, but Midway was not, even though Midway was much more critical to the overall war effort, and that prompted me to read this book. As this book is fairly new, it covers the most current research and understanding of the battle, which at least in a few cases is counter to the "received" history that many understand. The author spends extra effort to explain what the crypto folks did and did not have on the Japanese fleet's movements leading up to the invasion of Midway, and extra effort explaining what happened during the "flight to nowhere" when the USS Hornet's attack element flew away from the known contacts until they had to turn back for loss of fuel. In the first case the crypto folks had the date, target, and rough composition of the Japanese forces deduced, but not composition of task forces, or actual locations. In the second case the flight probably suffered from a combination effect of looking for a "second carrier group" (however, all four were operating together), and poor navigational technique. This book was quite enjoyable, and given that it is clearly a "general history" rather than a scholarly work, quite readable as well. I can now say that I know quite a bit more about the battle and what lead up to it, and since that was the goal of the endeavor, it should be judged as a success. The book also made me more interested in gaming this period, and I spent some time looking at the (glorious, and at $20 per CV costly) GHQ 1/2400 ships. Wargaming the Battle of Midway specifically would be difficult, since the battle hinges on the surprise of having three carriers where none are expected, timing of search patterns, and of course beyond visual range combat, none of which are easy to incorporate in a game, particularly without umpires (or computers). For that reason, it seems that a board game would probably do it best; however a search of boardgamegeek did not yield a clear "winner", so that avenue remains to be explored. 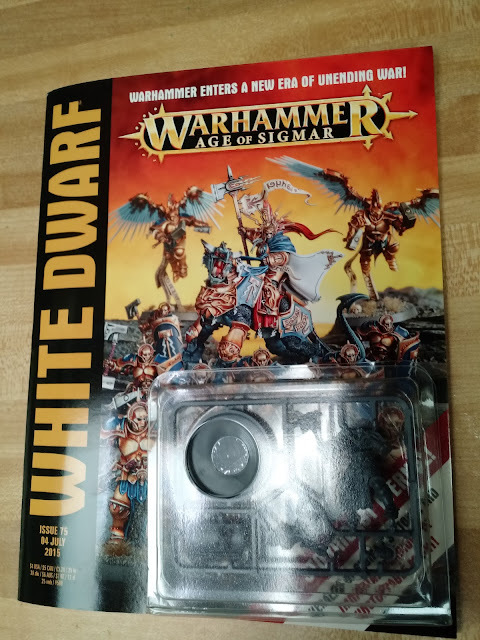 Well, I got White Dwarf 75, and it appears that all rumors about the new Age of Sigmar game are true. It does replace Warhammer with some sort of rules light skirmish game, and it does have Sigmar Marines, sorry "Stormcast Eternals" as being the fluff drivers in a new era with a bunch of new worlds. So the old world is dead... what is left? Well, terrible "fluff", new names (Orruks instead of Orcs and so on), and I suspect new models being the only focus going forward. (There are rules for existing models on the website, but it seems likely that only new figures will be featured in the future, and certainly in the new campaign books.) As someone with 4+ Warhammer armies, it is somewhat depressing, but to be fair, I have not ever played the game anyway, and was likely to stick with 6th edition when I did get around to it, so it is not much of a loss for me ruleswise... only in the demise of my beloved Empire. After that depressing stuff, lets move on to the cool part about this post, which is the Sigmar marine included with the White Dwarf. This is the first time since 5th Edition 40k that I have gotten a figure with the magazine (that time it was a Terminator and an Ork). Indeed this is the newest GW figure that I have, since most of my kits are older. I must say it was very sharply molded. 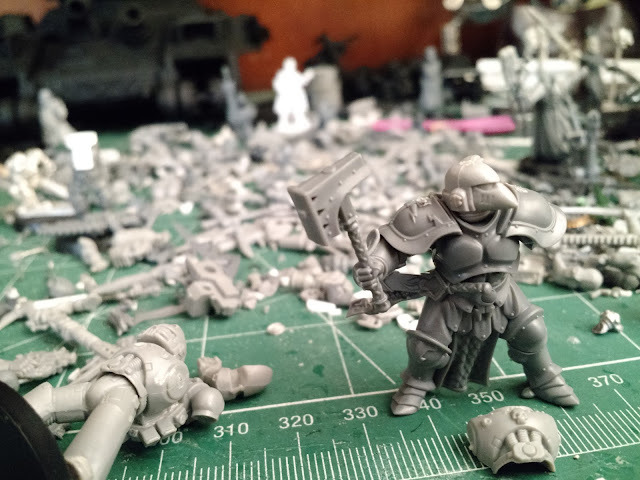 It may not be evident from pictures, but the figure is not a "press fit" one, in that the head, shield, and chest pieces need to be glued for permanency. In the picture below I super glued the shield arm but left everything else loose. Interestingly, the pauldrons are split down the middle, even down the middle of the Sigmar symbol. The fit is so tight though, that at least on the right side (the one with the symbol) you would never notice. 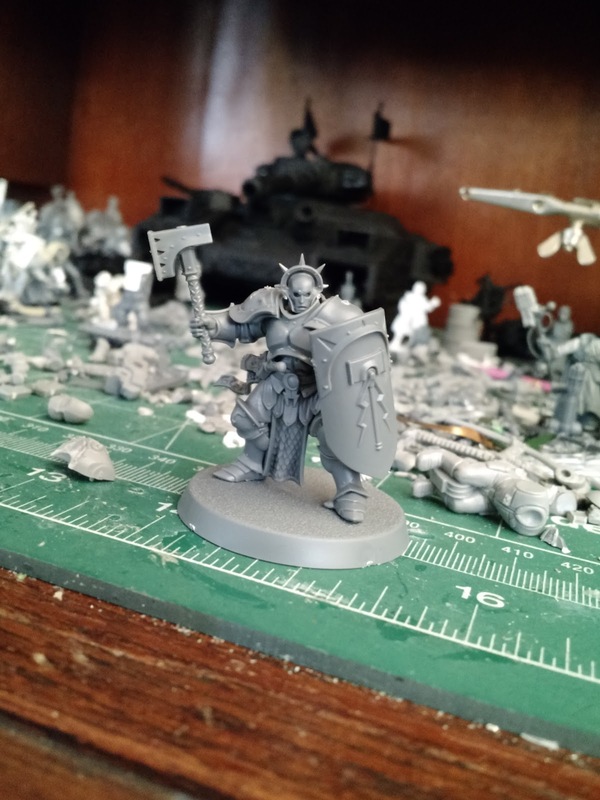 The conversion potential of this figure, and indeed the others from this set is pretty good... if you are looking to make true scale marines that is. When the first rumor pictures started circulating, I thought that maybe these guys would be useful for inquisitors, but as you can see from the slightly blurry picture below, they are very large. 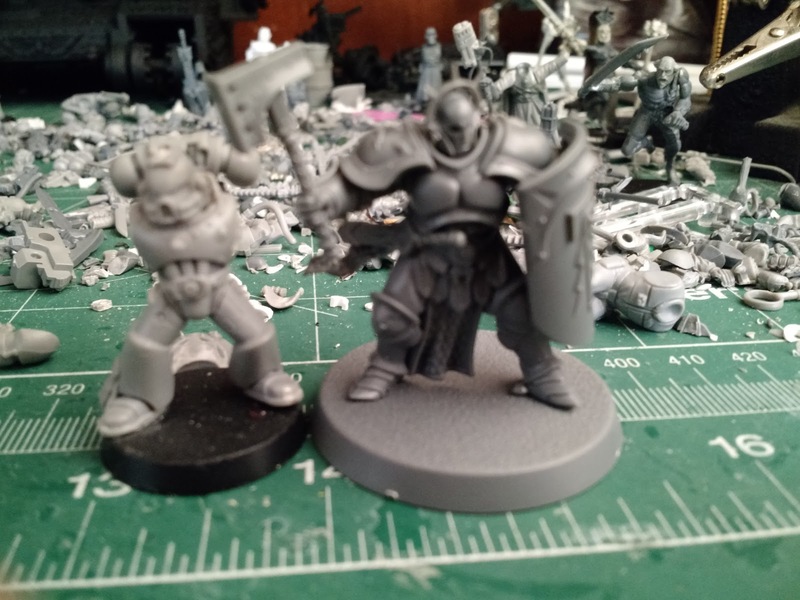 Fortunately they will work nicely as a true scale marine, with some judicious clipping, and marine arms. Mainly, I think that using marine arms, pauldrons, backpack, head, and a chest plate will be sufficient to do the job.